I’ve got a whole shelf of books I’m using as research for my current fantasy work. Books like Bear Grylls’ survival guide – how exactly do people light fires with a knife and a bit of flint? what is cordage? – books of British trees and wildlife and edible bits of both, books on the craft of writing, books on the Craft (religion), dictionaries and thesauruses (thesaurii?). There’s a second shelf of books on science, physics, the solar system, for when I get back to my SF work. 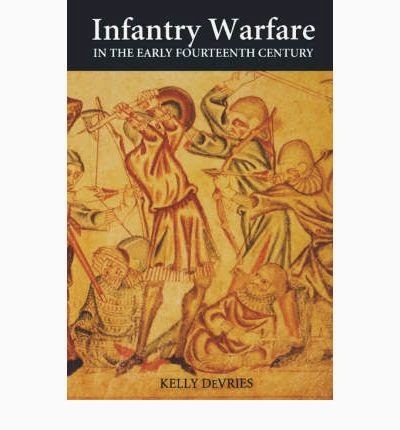 Currently I’m reading and highlighting passages from De Vries’ Infantry Warfare in the early Fourteenth Century, which is excellent and has diagrams of the battles so you can actually see who did what, where and how. It’s giving me a brilliant insight into infantry warfare with the sort of weapons available in my world. It’s also got a section on ambushes – how some of the best were crafted – and a section on sieges, which will be extremely useful. Most interesting is the fact that all of these battles were won with infantry, not cavalry. It’s changed the way I look at – and read – history and historical fiction. The idea of the knightly code, of chivalry, of the majestic thundering of a hundred destriers carrying men in plate. It’s romantic, it’s terrifying, it’s … awesome. It probably didn’t happen as much as you think. Just two lines of infantrymen armed with pikes could break a cavalry charge. They simply planted the butts of the pikes, leaned in and braced, and let the horses impale themselves. As soon as the first row is spiked, the rows behind drive into them. Front row knights are flung off their horses into the middle of the infantry and stabbed. End of. It didn’t always work, but generally, cavalry would only charge cavalry, because they had a greater chance of securing victory. To charge infantry, they knew their expensive horses would die, they knew they’d be fighting on foot in plate armour weighing over 100lbs, with vision limited and arm movement restricted. Who’d do that? I’ve also checked such little wonders as rigor mortis, sexton beetles (they eat people) and rates of decomposition on the internet, and I’m basically just waiting for the police to turn up and search the garden with a methane probe. Some people love research; some people hate it. Me? I don’t mind either way. One thing I don’t do is do all my research before I start writing. Who wants to waste three months of the creative process? So I do mine as I get to it in the plot. The reason I’m researching now? Ooh, there’s a big battle looming. There’s a siege, and night raids, scaling ladders, trebuchets and then hand to hand, thousands of men and women wielding steel and wood and doing their level best to hack each other apart.